I racked the second batch of IPA to two Party Pigs yesterday and I noticed the effect of the dry hops right away. (I added two ounce of pellet hops to the secondary. One ounce each of Kent Goldings and Willamette.) The beer is parked on top of my refridgerator, where it will sit until we start remodeling our kitchen. Unfortunately, the kitchen is also the brewery, so I might not brew again for a couple months. Hopefully the two and a half batches I have in storage will last me through the construction. Well, the IPA I brewed a few weeks back is already half gone, which should give some indication of how it turned out. 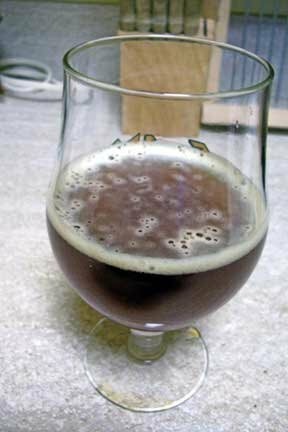 It's a sort of mahogany colored beer with some caramel nuttiness in the aroma, big hops in the flavor and a pretty bitter finish. It's a bit darker than I thought, almost a brown ale, but I guess that's the dark caramel malts I used adding a lot of color. I've gone ahead and brewed another batch, this time modifying the recipe somehwat, and using more extract. I'm planning on racking the beer with some dry hops, too. (I didn't use any dry hops in the first batch.) I'm hoping the new batch of IPA turns out as good as the first, if not better. Before I rack the IPA to the secondary, I'll have bottle a Belgian-style saison that I've brewed. The saison has been fermenting for about two weeks now. I was pretty surprised when the gravity dropped 40 points in five days -- that's a pretty healthy fermentation. I used the Wyeast Belgian Ardennes yeast. I had planned to add another yeast (Safale T-58) to further bring down the gravitiy, but I didn't think it was necessary.